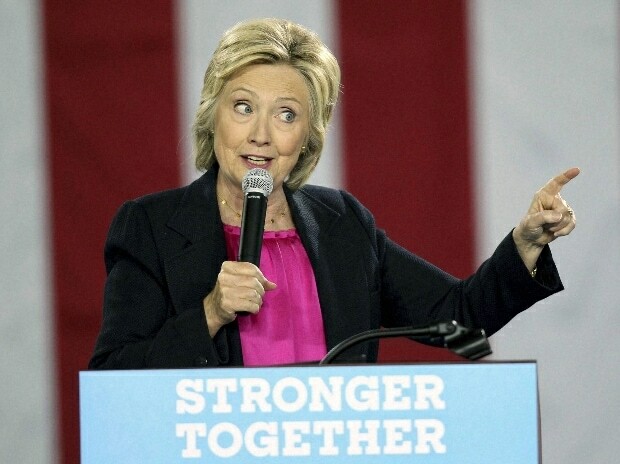 Democratic Presidential nominee Hillary Clinton, who has faced criticism for being aloof, told a popular blog she is aware she can be perceived as "cold or unemotional" and is not like President Barack Obama and her husband Bill Clinton with an "appealing" naturalness. "I know that I can be perceived as aloof or cold or unemotional. But I had to learn as a young woman to control my emotions. And that's a hard path to walk," Clinton told the immensely popular 'Humans of New York' blog on Facebook. Clinton cited an "intense" incident of how she was heckled by men during a law school admissions test in Harvard. She said she was among only a handful of women in the room when a group of men "began to yell things like: 'You don't need to be here.' And 'There's plenty else you can do'. "One of them even said: 'If you take my spot, I'll get drafted, and I'll go to Vietnam, and I'll die'. Clinton said even though the insinuations became "personal", she could not respond as she couldn't afford to get distracted and mess up the test. "So I just kept looking down, hoping that the proctor would walk in the room. Because you need to protect yourself, you need to keep steady, but at the same time you don't want to seem 'walled off'. And sometimes I think I come across more in the 'walled off' arena," the 68-year-old former secretary of state said. Clinton said in the blog post that is she takes responsibility for creating the perception of being walled off but she is not cold or unemotional. "I don't view myself as cold or unemotional. And neither do my friends. And neither does my family. But if that sometimes is the perception I create, then I can't blame people for thinking that," she said. In another post, Clinton said she is not like Obama and her husband Bill Clinton. "I'm not Barack Obama. I'm not Bill Clinton. Both of them carry themselves with a naturalness that is very appealing to audiences. But I'm married to one and I've worked for the other, so I know how hard they work at being natural. It's not something they just dial in," she said, adding that both the US presidents work and practice what they are going to say. "It's not that they're trying to be somebody else. But it's hard work to present yourself in the best possible way. You have to communicate in a way that people say: 'OK, I get her.' And that can be more difficult for a woman," she said. Clinton said women running for the Senate or Presidency have fewer women to look top to since most of the role models are men. "And what works for them won't work for you. Women are seen through a different lens. It's not bad. It's just a fact," she said. Clinton said she has learnt she cannot be as passionate in her presentation as the men. "I love to wave my arms, but apparently that's a little bit scary to people. And I can't yell too much. It comes across as 'too loud' or 'too shrill' or 'too this' or 'too that'. Which is funny, because I'm always convinced that the people in the front row are loving it," she said.